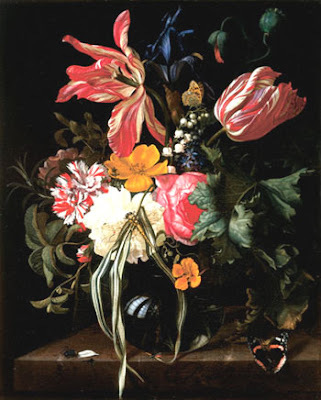 The Dutch still-life masters handled tulips beautifully, for the obvious reason that they were masters. 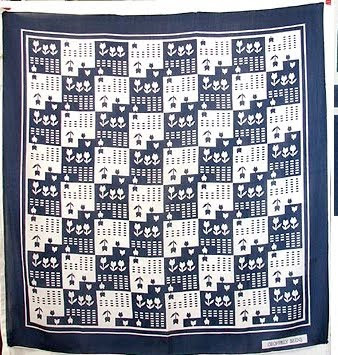 More recent attempts by fabric designers haven't fared nearly as well. In fact, this is an understatement. Because if 17th-century Holland had treated its bulbs with anywhere near the cackhandedness of many, more recent printmakers, the tulip boom would have been a bust before it even got off the ground. I'm not going to post any pictures of wretched tulip prints on dresses, blouses, and scarves, because they are so easy to find, and because they hurt my eyes. It is interesting to consider though, why so many are so very bad. Possibly because simplicity of form--and tulips are among the most austerely elegant of floral forms--is difficult to render accurately, while complexity is a lot easier to fudge. For this reason, it seems to me that the fabric designers who have had the greatest success in treating tulips have emphasized their geometry while downplaying their organic idiosynchrasies. And there is no mode of fashion that worked geometry better than Mod, and its groovy follow-on Op. 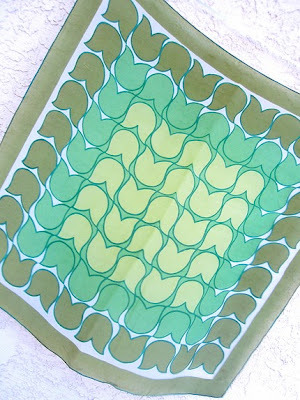 That's why these scarves, by Geoffrey Beene up top, and this one recently sold on Etsy.com below, could be stretched and framed and do a good imitation of a mid-century fine art print. 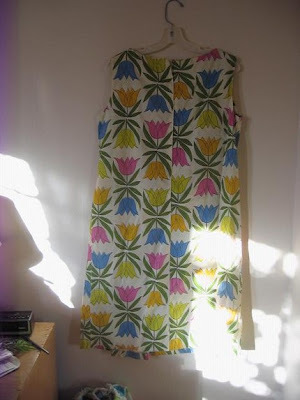 And even the humble housedress below, whose tulips look to be straight out of a mid-sixties cartoon, lends the flower more simple dignity than countless other renditions in finer fabrics and more intricate designs. It may not be a masterpiece, but as good design goes, it is very easy on the eye.